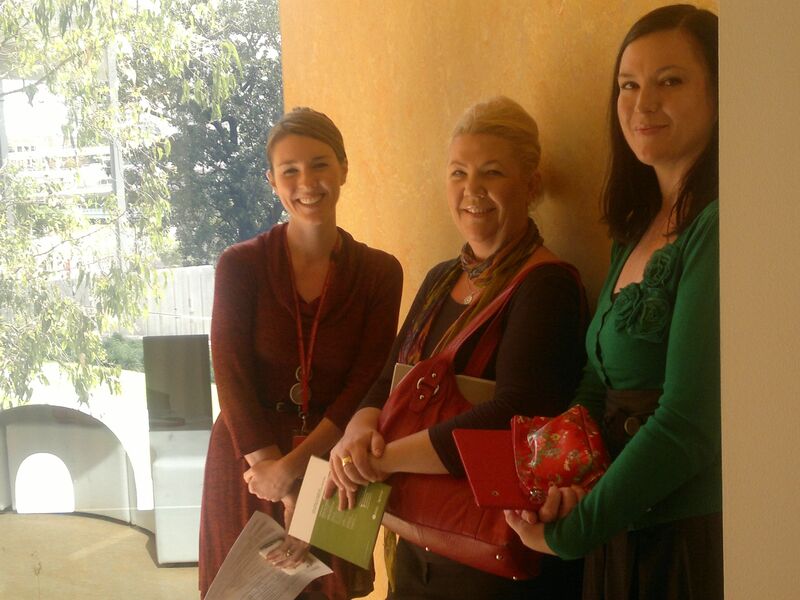 On 14- 15 June, M&GSQ staff, Debra Beattie and Ann Baillie were privileged to attend a two day workshop at Toowoomba Regional Art Gallery run by Adriane Boag and Sally Collignon from the National Gallery of Australia. The Art and Alzheimer’s Training Workshop is designed for arts and health professionals, volunteers and carers and supports regional gallery and aged care facilities to develop their own gallery program for people living with dementia and their carers. At the workshop we listened to a talk on Dementia from Ann Bingham, viewed demonstration tours conducted by Adriane Boag with visiting groups from a local aged care facility, learned about communication techniques, planned a gallery tour and brainstormed approaches to developing sustainable programs at the Toowoomba and Warwick regional galleries. After several years building a partnership, the Walker family and the Museum formally signed the Oodgeroo of the Tribe Noonuccal Custodian of the Land Minjerribah Collection Management Deed. Mayor Karen Williams was witness to signing the historic Management Deed. The Deed provides for the Museum to house and assist with the preservation of the collection, but allows for the material to remain in the Walker family’s ownership and control. Of particular note are the Management Principles that guide the relationship, which include a recognition of sovereignty, equity, respect and trust. Before the Deed was signed, the Museum Committee, staff and members participated in a Cultural Heritage Education Program (CHEP) with the Walker family. (Announced today in the newsletter of North Stradbroke Island Historical Museum). Shaw is currently Dean of the School of Creative Media at City University, Hong Kong. Shaw has developed what he calls “cultural heritage visualization”, a technique that he hopes will help preserve key sites around the world before the onslaught of mass tourism destroys them. Shaw said his most important project to date is a collaboration with the Dunhuang Academy in Gansu Province, China. Dunhuang is in an oasis amid the Gobi desert and a former gateway to and from China on the ancient Silk Road. The UNESCO World Heritage Site Shaw is working on is made up of 492 Buddhist grotto temples — or Mogaoku — which contain murals, statues and architectural monuments of enormous cultural and historical value. The material is presented in an interactive panoramic cinema known as AVIE (Advanced Visualization and Interaction Environment), which offers opportunities to experiment with virtual and augmented realities. Ann Baillie and Deannah Vieth recently visited two State Library of Queensland exhibitions Floodlines: a living memory and Floodlines: 19th century Brisbane. Both exhibitions concentrate on memories and stories of Queensland’s floods. Linda Pitt, Executive Manager and Naomi Takeifanga, Exhibitions Manager from the Learning & Participation Team generously hosted a tour for Ann and Deannah and thanks to their enthusiastic co-operation Peer Talk 2012 will present a review of both these exhibitions. Linda, Deannah and Naomi in Floodlines: a living memory’s reflection space. Floodlines: a living memory in SLQ Gallery, level 2, looks at contemporary memories of the natural disasters of the summer 2010-11. The exhibition features digital participation by Queenslanders submitting stories of their experiences in the Flood and Cyclone Mosaic. You can simulate the rise and fall of the Brisbane River across the CBD and affected suburbs using augmented reality technology, the Floodlines app which is available on the exhibition’s iPads or downloadable free from the iTunes app store. There is also the children’s corner, a space for reflection and a Flood of Ideas from the community on Flood Proofing Queensland. Floodlines: 19th century Brisbane in Philip Bacon Heritage Gallery, level 4, curated by historian, Helen Gregory, explores the history of the 1893 floods using items from SLQ’s John Oxley Library.